Rabbit anti caspase-9 antibody recognizes caspase-9 also known as apoptotic protease-activating factor 3 (APAF-3). Caspase-9 as the name implies is a member of the cysteine-aspartic acid protease family. 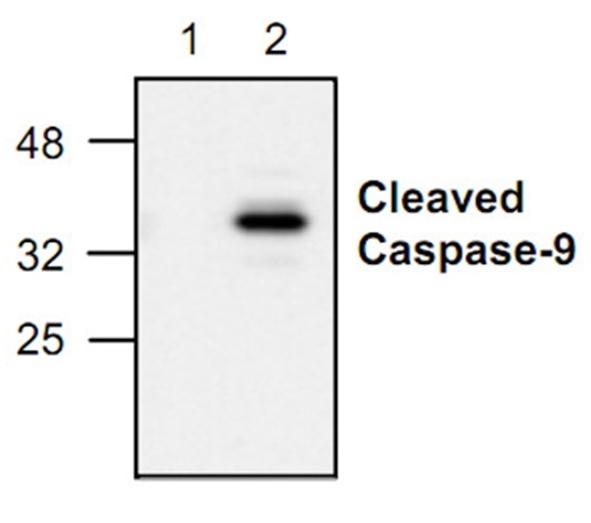 The active form of caspase-9 is generated via cleavage of the pro-caspase-9 protein into two fragments, known as the large and the small fragment. The trigger for caspase-9 cleavage is the binding of cytochrome c to pro-caspase-9, which is released upon receiving apoptotic stimuli. Caspase-9 is an effector caspase that plays a role in the mediation of mitochondrial apoptosis. Active caspase-9 cleaves pro-caspases 3 and 7 into their active forms. Caspase activity can be inhibited by c-IAP1, c-IAP2, XIAP and other members of the inhibitor of apoptosis protein family.